LAS VEGAS – Sept. 2, 2016 – Leveraging more than 50 years of passion and performance, Shelby American, Inc., a wholly owned subsidiary of Carroll Shelby International Inc. (CSBI:PK), today unveiled the all-new 2017 Shelby GTE (for Enhancement) during Mustang Club of America’s celebration at the famous Indianapolis Motor Speedway. Inspired by the success of the Shelby GT and Shelby GT-H programs, the Shelby GTE offers legendary performance at an affordable price. In 2006, Shelby, Ford and Hertz launched a new rental car program. When the public clamored for a consumer version of it, the 2007 Shelby GT was launched and sold through American Ford dealers. The Shelby GT matched the performance capabilities of the rental version but could be optioned with a manual transmission and as a convertible. Ten years later, Shelby GTE is based on the all new world-class Ford Mustang. Complete with an independent rear suspension and several powertrain options, it is the best performance Mustang in history. With Ford now exporting the Mustang globally, plans are being developed to offer the Shelby GTE outside of the USA and Canada, also. Under the hood of this Shelby,customers can choose Ford’s iconic 5.0 V8 engine that pumps out 456 horsepower or the powerful 2.3L Eco-Boost engine that delivers a head turning 335 horsepower. Additional performance upgrades include a Ford Performance cat-back exhaust and handling pack, as well as 19 inch Ford Performance wheels. One look at the pony car reveals unique Shelby styling. The car is fitted with official badges, Shelby-designed vented hood, carbon fiber front splitter and rear spoiler. Inside,it also features Shelby GTE logos on the head restraint, sill plates and floor mats. Unlike the rental car program, the Shelby GTE is available in either fastback or convertible, as well as manual or automatic transmission. Thanks to Shelby’s network of partners, enthusiasts will be able to experience world-class performance that has become synonymous with the Shelby brand. Shelby American introduced the all-new Shelby cars at historic Indianapolis Motor Speedway during the Mustang Club of America’s 40th anniversary celebration. After the unveiling and presentation of Shelby American’s latest Mustang, the all-new Shelby GTE will move to the Dallara Indy Car factory.It will be the centerpiece of a special Team Shelby event. The cars will be assembled by Shelby American at its assembly facility in Las Vegas or authorized North American mod-shops. 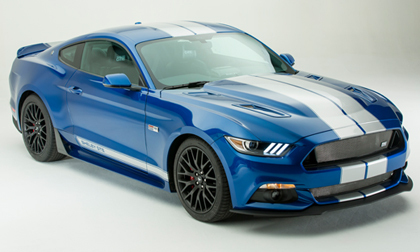 Every car will be listed in the official Shelby Registry. For more information about the all-new Shelby cars or a list of authorized dealers worldwide, visit www.shelby.com. Founded by legend Carroll Shelby, Shelby American manufactures and markets performance vehicles and related products. The company builds authentic continuation Cobras, including the 427 S/C, 289 FIA, 289 street car and Daytona Coupe component vehicles; it offers the Shelby GTE, 1000, GT500 Super Snake and Shelby Terlingua Racing Team post-title packages for the 2005-2017 Ford Mustang. Shelby American also offers the Shelby Raptor and Shelby F-150 muscle truck. For more information, visit www.shelby.com.